Featuring: Youa Yang & Allison Haley, Barlow Research Associates, Inc.
It’s 2019 and the digital transformation initiatives are in full force. At the top of the list of digital initiatives is bringing more advanced functionality to mobile banking. 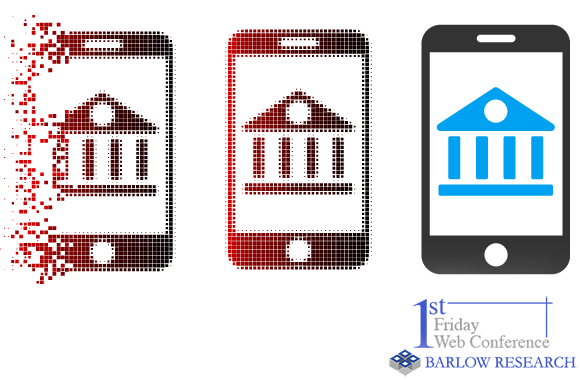 In its infancy, mobile banking had only a few core functionalities such as viewing account balances and transferring money to internal accounts. Today, mobile banking for businesses, particularly small businesses, has expanded far beyond what we could have ever imagined 10 years ago. Driven by mobile-first strategies, leveraging available technology and customer expectations, leading financial institutions are continuously working on refining their mobile offering to be an easy to use channel that is always available for the banking customer. The presentation is designed for anyone involved in digital business banking, customer experience, transformation, small or middle market banking line of business, marketing, market research or strategy. Please register before Noon Central Time on Thursday, February 28th, 2019. All authorized registrants will receive a reminder email with connection instructions and a link to download a copy of the slide presentation on the afternoon of the day before the scheduled web conference.